At Watersavers Turf, we carry over 60 types of drought-friendly artificial lawn, with great choices for decks, patios, and poolside zones. From design experts to backyard engineers, trendsetters are adding a pop of green to outdoor residential areas with carpets of waterless green. HGTV recommends artificial lawn installation on patios and decks to encourage outdoor dining. Al fresco dining is a hot quality-of-life trend right now, but live lawns don’t hold up well to the wear and tear. The shade and pressure of tables and other furnishings leave “dead zones” on real grass because the furniture blocks oxygen and sun. Synthetic turf keeps its uniform green color, no matter what you put on top, so it’s a great substitute. A dining area on synthetic lawn means a great look that’s durable. Chairs that slide in and out over the same area multiple times per meal are hard on these plant blades. On a traditional yard, this heavy use kills blades, and over time, can turn your dining area to dirt. Synthetic turf is up the challenge, and can handle the heavy traffic without damage for years. The artificial lawn has inspired some cutting-edge pool designs. An engineer from Israel, Gil Klar, built an amazing hidden pool which has a retractable cover with a carpet of synthetic grass that transforms the yard from full lawn to swim area and back again. 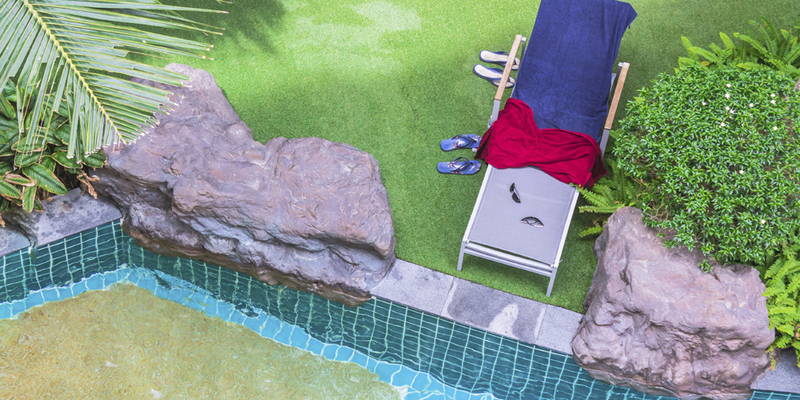 Synthetic turf is highly sought after for bold pool designs that keep one eye on style, and the other eye on safety. Hardscape can be slippery when wet, but the quick and complete drainage of our products means a slip-resistant surface. Pool chemicals can damage live grass, leaving trails of mud or bare dirt marking where pool water is tracked. Those landscape areas become injury hazards, as they can’t offer traction. Synthetic turf can stand up to chlorine or saline. No matter what’s in your pool or spa water, your artificial grass yard stays green and soft and helps prevent slips while looking its best. Live grass will only retain its pure green color for your landscape with plenty of sun, water, frequent grooming, and plenty of dirt. Those needs are hard to meet when you have limited outdoor space. Balconies can be tough to mow, and are often in partial or full shade. In a small yard or patio area, planting living green right up to the door of a home is often a no-go; the dirt of a live lawn can too easily be tracked in, leading to an indoor mess. With our product, you can roll out a soft, clean carpet of green that has a realistic texture and color on any surface. From a square inch to a square foot, our product fits anywhere, so you can maximize green in a limited space and reduce the amount of dirt. The more inviting your outdoor space, big or small, the more time you’ll spend there. For more about how to use our product line to bring out the best in your outdoor space, contact Watersavers Turf for a free estimate, chat with us online, or call us for an expert consultation.